Is Wind Energy taking over the Planet and Saving it? Renewable energy has come a long way in a relatively short time. But there are still many questions about the cost effectiveness and feasibility of investing in renewable energy sources such as solar or wind power, especially on an individual level. Solar power has led the renewable energy pack for years. In terms of long-term reliability, solar power generation has the best odds of meeting global energy needs.http://www.scientificamerican.com/article/coal-boomtowns-fade-as-china-declares-war-on-pollution/ However, as far as current global production rates go, wind-generated power often runs neck and neck with its sunny counterpart. New designs and technology are driving diversity in the wind power sector at a rapid pace. If we’re really looking to create energy security from a natural resource, the answer may literally be blowing in the wind. Although solar power could be considered the face of renewable power generation, wind is the go-to choice for many countries. In fact, global energy generated from wind farms has increased tremendously in just the last two years. According to the Global Wind Energy Council (GWEC), 51,477 megawatts (MG) of wind capacity was installed globally in 2014, a 44 percent increase over previous years. According to the World Wind Energy Association (WWEA), China is the world’s largest producer of wind power, with approximately 114,763 MG of installed wind capacity.http://www.wwindea.org/webimages/WWEA_half_year_report_2014.pdf This is significant, considering that conventional power generation methods are unlikely to fulfil the country’s future energy needs. In the U.S., the Wind Program was initiated almost 10 years ago to collaborate with industry experts who wanted to “increase the performance and reliability of next-generation wind technologies while lowering the cost of wind energy.” This program is essential to developing new technologies that improve turbine performance on a large scale. So how does wind power extend to the local level? Scotland produced 982,842 megawatts of wind power in late 2014 and generates 126 percent of the country’s household energy needs. Sunny Spain is also looking for innovative ways to provide local communities with cost-effective renewable energy systems. For example, the Iberian Peninsula has plans to install the world’s first public streetlight system that works with both solar- and wind-generated power. Additionally there are efforts to create more compact and aesthetically pleasing wind turbines for local communities. French engineers invented the silent Wind Tree Turbine. The turbine’s inverted blades enable the units to turn in the wind, generating power silently in the process. The quiet “trees” do not obstruct the landscape as much as conventional turbines, which makes them a viable option for urban areas like local gardens, parks, and community areas. Another exciting development in wind turbine design is the aerial kite. A company called Makani invented the Energy Kite, which is designed to generate more energy with roughly 90 percent less material than most wind turbines. The Energy Kite is not only a renewable source of energy, but also more sustainable to manufacture. Using the same principles as the conventional wind turbine, the Energy Kite replaces heavy steel components with lightweight features and advanced materials such as lightweight carbon fiber. Essentially, rotor blades launch and lift the kite from a ground station until it reaches 800 feet above ground. At this height, the wind is stronger and more consistent, which allows the rotors mounted on the kite’s wings to drive the generators and produce energy. The energy is carried back to the grid through a conductive tether that connects the kite to the ground station. Advanced software uses GPS and sensors to calculate the kite’s movements in various weather conditions. Building on the idea of kite floating turbines, the airborne turbine is currently the latest in wind power generation. Similar to the computer-controlled kite, these helium-filled turbines float 1,000 to 2,000 feet up in the air, where they catch air currents that are an estimated five to eight times more powerful than ground wind. What Can Wind Do for You? Wind power is not a new concept. For more than two millennia, wind-powered machines have helped communities around the world grind grain, pump water, and tackle other laborious tasks. Despite occasional dips, energy costs continue to rise. With wind turbines now available on a much more affordable, small-scale level, savvy homeowners can generate their own wind energy. Unfortunately, the stigma of clunky, noisy wind turbines puts off many people who want to generate their own energy. However, there are some impressive and functional turbine models that aim to power homes and local businesses. Small, bird-friendly wind turbines can be both aesthetically pleasing and highly productive. 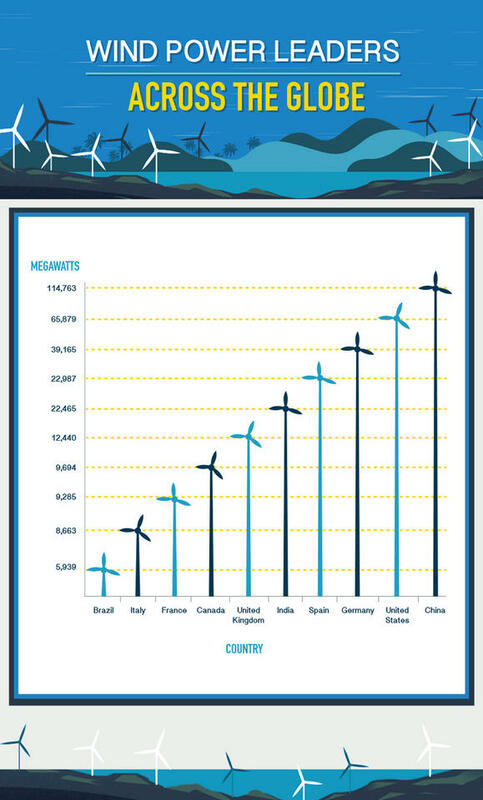 In fact, modern wind turbines can produce an estimated 15 times more electricity than the typical turbine did in 1990. If you’re serious about installing a wind turbine, the process can be as easy as visiting Home Depot. (The home improvement store started selling personal wind turbines in select states in 2011.) No matter where you buy your wind turbine, there are some important factors to consider. First and foremost, the installation of a wind turbine is not inexpensive. The cost of a wind power system strong enough to power an entire home can run anywhere from $10,000 to $70,000, depending on the system’s size and height as well as installation and maintenance costs. Tiny off-grid turbines, which produce less than 1 kilowatt of energy per hour, can cost as little as $4,000.http://www.energywise.govt.nz/your-home/generating-your-own-energy/wind Some models claim to generate up to 400 kilowatt hours of clean electricity per month, which means long-term savings, as well as the ability to sell surplus energy back to the local grid. Tax rebates are another incentive: homeowners may qualify for a rebate on a turbine purchase with local, state, and federal incentives. The Residential Renewable Energy Tax Credit offers a 30 percent federal tax credit for small wind-energy properties. Be sure to research the potential return period on the initial investment before making a large up-front investment. According to the Wind Energy Foundation, the payback period depends on the turbine as well as the quality of wind on-site, electricity rates, and state and federal taxes. These factors vary by location, but a homeowner can expect to fully recover up-front costs in 6 to 30 years. A typical American home requires a small turbine that generates between 2 kilowatts and 10 kilowatts of wind power. A small turbine with at least a 5-kilowatt capacity would have a diameter of approximately 18 feet. Although designs have come a long way over the last 10 or even 20 years, a massive three-pronged tower can still steer people away from wind turbines despite the benefits. Unlike solar panels, which lie flat on rooftops, wind turbines are almost impossible to hide because they depend on height to be productive. Even a small turbine measures at least 80 feet tall – almost twice the height of a standard telephone pole. Blades can be anywhere from 30 to 140 feet across. Although the height of a wind turbine affects its productivity, the generator size and height are not related. A simple 5-kilowatt turbine could be between 30 and 140 feet high. Before installing a turbine, check local zoning codes. Typically, local codes can include a minimum lot size requirement or may have other rules such as a minimum distance requirement from a property line. Unfortunately, local code restrictions are often a large hurdle for personalized wind power generation and are mostly likely the reason why less than 1 percent of small wind turbines are found in urban settings. Of course, we can’t put all of the blame on local bureaucracy. Besides meeting local code requirements, wind access is another challenging factor. Regardless of size or kilowatt production, all wind turbines need unobstructed access to winds – something quite difficult to find in densely built communities. Although there may be a few hurdles to overcome, all is not lost. Many turbine manufacturers are well versed in local permitting processes and are often willing to help customers on their journey to energy independence. As usual in technology of all kinds, innovative design often follows mass demand. Although there are quite a few obstacles accompanying personal wind power generation, new options continue to enter the market. Innovative companies and start-ups are designing and producing efficient, aesthetically pleasing turbines for individual use. The Eolic is a portable turbine mounted on a telescopic pole, which is a great option for urban dwellers. Although the Eolic isn’t on the market yet, the tiny carbon fiber and aluminum turbine has captured a lot of attention for its small, powerful design. Another recent addition to the personalized wind turbine market is LIAM, a compact turbine with an output that averages between 300 and 2,500 kilowatts, depending on wind speed and roof height. Of course, the cost is probably the only element higher than its height requirement. At approximately $5,452, the mini wind turbine isn’t as wallet-friendly as it is eco-friendly. Then there is the small but mighty Rose Wind Turbine, a tiny portable device that is compact enough to fit into the trunk of the car. This rose-shaped device is extremely quiet, which makes it a great choice for expeditions like camping trips, backyard barbeques, and beach outings. The turbine market is a magnet for increasingly efficient designs and avant-garde concepts, many geared to the individual homeowner looking to become energy independent. The primary downside is cost, which is unfortunately still on megawatt levels for most.